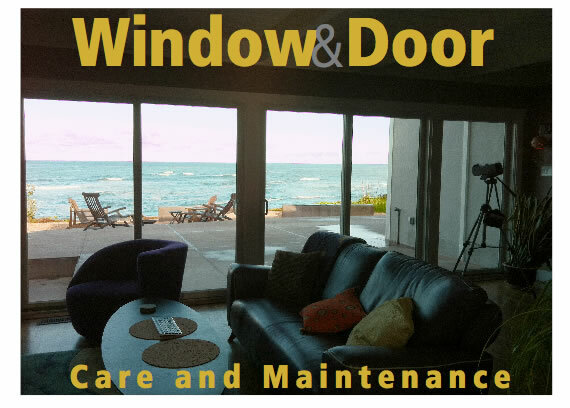 Caring for your windows and patio doors. Most windows require very little effort other than light cleaning. . With just a little routine cleaning and lubrication, you can ensure your windows and doors will continue to perform for years to come. You can should wash your windows and doors with mild, nonabrasive soap and water. Never use abrasive or acidic cleaners or pads they might cause permanent damage to the frame finish. Always test cleaners in an inconspicuous area first. Wipe dry when finished. 1. The best practice is to clean glass with a mixture of mild dish soap and water. When finished, rinse completely with clear water and wipe dry with a soft cloth. • High-pressure washer or water hose. 3. When cleaning screens, use only mild soap, water and a soft brush. When finished, rinse with clear water and wipe dry. twice a year is recommended. 2. Regularly check weatherstripping to ensure your windows and patio doors seal airtight. 3. Occasionally vacuum the tracks on all windows and sliding patio doors to remove any dirt or debris. 4. Most sliding patio door rollers can be adjusted for proper height clearance. To adjust, insert a screwdriver through the access hole at the bottom of your patio door. Heavy rains can sometimes be unforgiving. Most windows and patio doors have a specially designed "weep" drainage system with vented slots on the exterior bottoms of the frames to allow water to escape while minimizing air infiltration. Proper maintenance of your weep system is required to assure proper drainage. 1. The weep system allows water to drain to the outside as it builds up. It's normal for water to build up on the sill or the outside track, which is why it's important to keep the sill or track clean of any dirt or debris. 2. Periodically inspect the weep holes on the exterior bottom rails to make certain they are clear of any dirt or debris. Use a soft brissel brush to clear openings, if necessary. A good time to inspect and clean weep holes is before rain is anticipated. How to reduce excessive window and patio door condensation. 1. Check all windows and patio doors for smooth operation and airtight seals. 3. Use a room fan or ceiling fan to continuously circulate air. 4. Open windows and doors when practical to reduce excessive moisture inside a home.